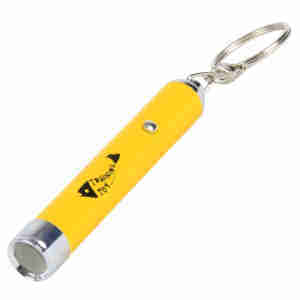 There’s hours of fun to be had with the Trixie Cat LED Pointer Catch the Light in Yellow. Keep your furniture safe from excitable cats and kittens with this LED pointer. Cats love to chase movement, making this toy an ideal way to keep your pet occupied for hours. Shine the torch onto a flat surface in your home to project the shape of a fish. Move it a few feet this way and that, and watch your cat stretch those muscles – all the while having fun. This pointer has a life of 100 hours, giving you and your cat plenty of entertainment time. You can also use this gadget as a training aid: it can help teach your cat good behaviour, or help your kitten locate the litter box. Indoor cats will sometimes need that extra help to keep them fit and active, as they often lack the space needed to run, jump and climb. Help them prevent weight gain with the Trixie Cat LED pointer. Because the pointer is designed to fit on your keyring, it's always to hand if your cat needs some encouragement to exercise. This toy can also be used with treats at playtime to reward good behaviour, or help your new kitten locate the litter box. If you're concerned about training your cat, or have noticed behaviour that you could do without, we recommended having a talk with your local vet. I bought 2 of these, one for my cat & one for my mothers cat. My cat runs after it for a few minutes and gives up, but my mothers cat is a bit more active & loves it. It works well in the dark or if you shine it on a dark carpet, but is difficult to see during the day, but I don't mind that as its safer than a laser pen. Bought this as a cheap add on to my order and has been a hit for my cat- her new favourite toy! She hears the jangle of the keyring when you pick it up and jumps up to play. For the lazier owners out there, this means you can play from the sofa without getting up! If it's bright daylight it doesn't show that clearly to me but my cat seems to still see it most of the time, however I read that these can be safer for the cats eyes than the lazer point type ones, so I presume this is why.